Mountain bikes in the $1,500 range are going to be serious contenders among the high-dollar bikes you might encounter. You can get a trailworthy bike that will get you through miles of smiles for a long time before upgrade-itis sets in. Bikes in this price range feature technologies that have trickled down, such as lighter and more tuneable suspension, more progressive frame geometry, tubeless-ready rims, wide-range 1×11 gears, and confidence-inspiring hydraulic brakes. Many of the bikes in this list will readily accept an internally routed dropper seatpost as well. If you’re not sure what style of bike will best suit you, or you’d like to spend a little more or less, check out our Mountain Bike Buying Guide to narrow down what your skills and terrain will demand of your bike. At this price point, you will generally get a better-equipped hardtail than a full-suspension for your buck. As this price point is at the lower end of the spectrum for full-suspension, manufacturers lower production costs by using a less sophisticated suspension linkage design, or lower grade components. If your riding style, local terrain, or your body demands full-squish, by all means, make that a priority. You can find more of our full suspension recommendation here. Volumes have been written about what current wheel/ tire size is “better,” but your preferences will determine what’s best for you. The size of a bike’s tires does not determine the type of bike that it is, but some wheel sizes do some jobs better than others. Most of the bikes in this category are going have conventional 29” tires, 27.5” a.k.a. 650B tires, or the relatively new but increasingly popular “B-Plus” or “mid-fat” wheels, which use a wide 650B rim with XXL treads in the 2.5”-3” range. Modern mountain bikes come in a variety of frame dimensions that suit some riding styles and terrains better than others. A beginner or casual rider might want something more upright, with steeper angles and shorter reach, which will be nimble at slow speeds, while a seasoned rider will want something more aggressive with a rear-wheel bias (short back end, long in the front), and a more slacked-out fork angle. Your local bike shop is a great place to buy a new bike. A good bike shop will guide you to the best bike for you within your budget, assemble the bike with precision, help you generally fit the bike, quickly resolve warranty and mechanical issue you may have, and support your local riding community through supporting events and trail advocacy. At any given price level, manufacturers offer very similar bikes, so your confidence in the expertise and professionalism of the shop itself might be more important than the bike. Online retailers will sell some of the same or equivalent bikes, and some manufacturers sell direct to customers online only. Generally, you will get more bike for your buck by purchasing online, but that comes with some hidden costs. The price of a bike purchased online does not include assembly (doing it right is harder than the average rider might think! ), subsequent service, fitting, or other services that your local bike shop might have rolled into their price. Additionally, you can’t test-ride a bike that only exists online until it’s on your doorstep, so you’ll have to rely on the manufacturer’s word, and impartial reviews to determine what size will suit your body and abilities. If you are not a competent bicycle mechanic (or can bribe one with beer or cookies), you’ll need to include the cost of professional assembly and tuning in your price. Salsa created the Timberjack to be capable and versatile, capable of supporting a medium-travel fork, singlespeed drivetrain, and multiple bottle cages. It’s a genuine jack of all trades capable of racing, bikepacking, and trail riding. The aluminum frame features progressive geometry with a long top tube, slack head angle, and short chainstays, and cutting-edge features like clearance for B-plus tires, internal cable routing, a 1×11 speed drivetrain and Boost hub spacing. Marin’s Hawk Hill line exemplifies the modern trail bike category with progressive geometry: a long top tube, slack head tube angle, short stem and wide bars. The suspension design is shared among Marin’s high-end full-suspension bikes and features stiff thru-axle hubs. A medium-travel Rockshox fork, Shimano brakes, 1×10 drivetrain, and tubeless-compatible rims rounds out the build. 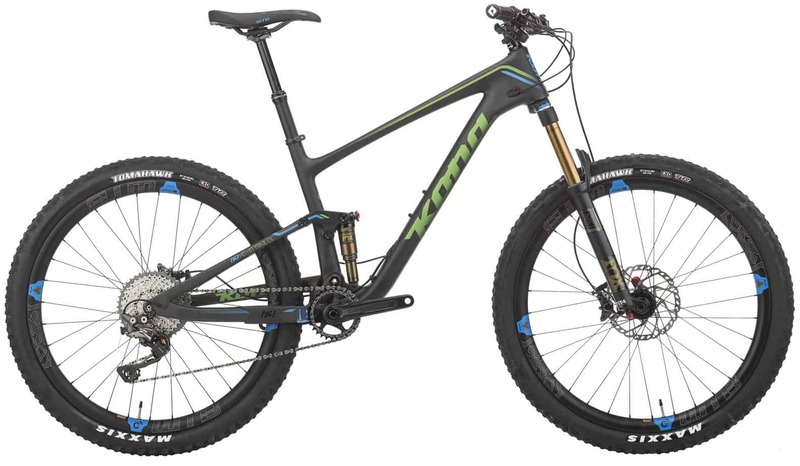 The GT Verb is arguably one of the best budget full suspension bikes on the market. GT invested in the frame and suspension, but clearly saved on components, leaving room for upgrades down the road. The Surly Karate Monkey complete bike is a steel-framed, rigid (no suspension), general purpose mountain bike. It is equipped with a 1×10 drivetrain and 27.5 + wheels, but can be custom-built for just about anything- 29” XC singlespeed hardtrail, rigid long-haul bikepacking, general trail riding, urban cruiser. This bike has a long pedigree as a workhorse for riders who prefer simplicity and a direct connection to the trail. For the price, some riders will pick it as their “spare” bike for those days when their complex squishy/gearie bike is not behaving and to challenge their skills by foregoing suspension and gears. The Honzo stands out as a bike with geometry on the extreme end of the scale with a long front end and an unbelievably short chainstay for 29er. The geometry lends itself to downhill stability and the front-rear balance makes it a breeze to huck over rocks and logs. Wide and tubeless-ready rims, a 120mm Rockshox air fork, and Shimano brakes make this bike a great package for all-day, all-terrain riding. If a world where boys seem to get all the best toys, Trek stands out as a company that takes its female customers seriously. Trek’s long-standing commitment to WSD (women specific design) bikes and components has culminated the the Roscoe 8, a “mid-fat” hardtail with progressive geometry tweaked for female fit. The mid-fat 2.8-inch tires wrapped around 650B wheels, wide ranging 11-speed drivetrain, women’s Evoke saddle, and internal cable routing make this a slick, confidence-inspiring ride for trail-shredding women as any skill level.